Fritz Lang returned to Germany on the eve of the 1960s to direct this enchanted penultimate work, a redraft of the diptych form pioneered in such silent Lang classics as Die Spinnen, Dr. Mabuse, der Spieler, and Die Nibelungen. 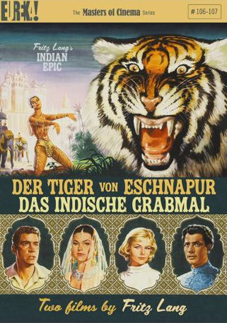 Although no encapsulating title was lent at the time of release to what is, effectively, a single 3-hour-plus film split in two, the work that has come to be referred to in modern times as "the Indian epic" (consisting of Der Tiger von Eschnapur and Das indische Grabmal) proved to be one of the legendary director's most adventurous achievements. It was also one of the most popular successes Lang was to experience in his native land. A German architect (Paul Hubschmid) is commissioned by an Indian maharaja (Walter Reyer) to construct a temple on his palatial grounds. After saving the life of a bewitching dancer (Debra Paget) on whom the maharaja has spousal designs, the pair are drawn into a hazardous maze of traps, perhaps the purest realisation of Lang's obsession with a labyrinthine 'house of traps' – that is, Man challenging Fate. Like Lang's following final work Die 1000 Augen des Dr. Mabuse, the Indian epic charts new territory for the director, as it strikes out into the über-melodramatic tenor of his early silents while instigating the colours of his emulsion into adopting a lurid, sometimes gaseous palette. Arriving in the wake of The River (Renoir), India matri bhumi (Rossellini) and Black Narcissus (Powell & Pressburger), it also stands among the remarkable mid-century contributions of the greatest Western filmmakers who have explored India.